“In mission work, it’s very important to have educated church leaders to help lead the churches for them to be sustained like they need to be,” says Bro. Gene Gillis, Interim Pastor Immanuel Baptist Church (Columbus, Miss.). It was this desire to educate and empower local church leaders that resulted in the launching of the HMM pastors’ training schools. Since fall 2014, there have been four sessions hosted in Haiti and one in the Dominican Republic. The sessions typically last 2-3 days and involve intensive study of the Holy Bible. There are prepared sessions as well as question and answer sessions, and of course, several delicious meals. The schools are designed to be a time of study, worship and fellowship to help educate, empower and connect local pastors in Haiti and the Dominican Republic. When he first began dreaming of the training for pastors on the island of Hispaniola, Bro. Gene was actually focused on launching the initiative in the Dominican Republic. He recalls discussions with Tim Dortch, HMM founder, about purchasing land and building a seminary in the Dominican. After the earthquake in Haiti in January 2010, however, the focus of the ministry shifted significantly toward Haiti. In spring 2014, Bro. 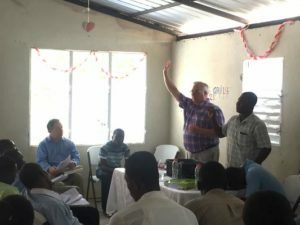 Gene began to meet with Scott Wilson, then the Interim Executive Director of HMM during Tim’s illness, to discuss what these pastor trainings might look like for pastors and leaders in Haiti. He recalls feeling the weight of the decision to step out in faith and pursue this plan because of the extensive resources needed. It was going to take a lot of money and the right people to make it happen. “But you just walk in the direction you feel like God is calling you, and He will fill in the details as you faith walk,” Bro. Gene says. 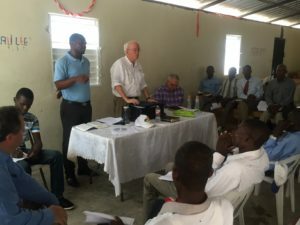 The first pastors’ training in Haiti was held in November 2014 and from the beginning, the Haitian pastors responded with tremendous enthusiasm – just a great hunger for The Word. Bro. Gene was flanked in the inaugural session by Bro. Kevin Jenkins, Family Pastor and Administrator at Fairview Baptist Church (Columbus, Miss.) and Bro. David Honeycutt, Associate Pastor for Students & Missions at Pleasant Hill Baptist Church (Columbus, Miss.). About 50 pastors and church leaders arrived for the three-days session, many walking or traveling hours just to soak up God’s Word and meet other local pastors. Bro. Kevin recalls his realization that week that these men were facing such great obstacles to lead in their communities – many of which American pastors could not imagine. “In America, pastors have so many resources, but these men [the Haitians] are just as much pastors and leaders for their churches,” he says. “It was very good for the area for them [the pastors] to come together and have the opportunity to meet and know each other and learn more about working together,” says Bro. Gene. He adds it is also helpful for HMM to bring these pastors together to know more about the specific needs in their communities so that the ministry’s growth into these areas can be strategic. Currently, the pastor trainings are held in the spring and fall in Haiti. The Dominican training was held October 2015. For more information about becoming involved in this ministry, please contact HMM at info@gohmm.org for upcoming pastor training dates and needs.